Recently I revisited one of my old pentomino coloring problems, modified to apply to a tiling of a torus rather than a rectangle. That worked out well, so I might as well shamelessly continue to mine this vein. Problem #47: Find a tiling of a torus with this tilted square as its fundamental domain by the one-sided pentominoes with a three-coloring as described above. 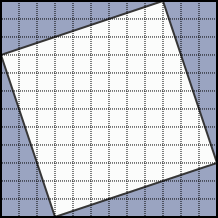 If possible, find a tiling with no crossroads. Problem #48: Find a two-colored packing by the pentominoes of a torus with minimal area. Obviously, you could just take the rectangular packing above and add a one unit “moat” around it to get a torus with a 14×6 rectangle as its fundamental domain, but surely we can do better.